Para 3 a 5 jugadores de 14 años en adelante. Five competing railroads, in search of Midwestern grain and markets, crossed the Appalachian mountains in the early 1850s: the New York Central, Erie, Pennsylvania, Baltimore & Ohio, and, via Canada, the Grand Trunk, backed by Boston merchants. In front of them were literally hundreds of failed local railroads, most existing only on paper, but a few had laid bits of track and acquired locomotives, before running out of capital and being sold to Eastern interests in 1846. Can you knit together these private companies and Eastern railroads to form the most profitable rail network in the Midwest, stretching to Chicago and St. Louis and connecting East and West? Players begin by investing $400 apiece in drafting private companies and launching corporations. WIth fewer than five players, some companies and corporations are randomly removed, making each game different. Play consists of alternating stock rounds with pairs of operating rounds. During stock rounds, players buy and sell shares, possibly launching new corporations. During operations, each railroad -- with its majority stock holder (President) making all its decisions -- lays track and stations, runs routes, declares dividends, and possibly buys bigger and better trains. As new train types appear, older trains go obsolete, representing technological progress. A corporation without a train must buy one -- with its President having to make up the difference out of pocket if the corporation doesn´t have enough cash! The game ends once the bank runs out of money. The player with the best stock portfolio and most cash on hand -- not including any money in corporations -- wins! 1846 is an ´18xx´ game, one of many games by different designers inspired by Francis Tresham´s 1829. 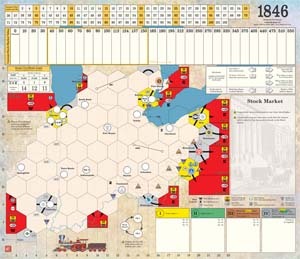 1846 has several unique features, such as its opening draft, variable setup, and (comparatively - 18xx games tend to be longer-playing, but this is one of the shorter ones) shorter game length, which are good for players new to 18xx. 1846 features a nice balance between portfolio management and board play (track and station lays and building profitable routes). It is highly rated on BGG but has been previously available only by small press publication. GMT is proud to offer this new version of 1846, with enhanced components, as our first 18xx game. 1. We´re not changing anything in terms of game play. This will still be the 1846 game you love, just with better components. 2. Regarding the components, besides putting the map on a mounted game board, we´ll be using half-size playing cards for the Stock Certificates and trains, and the Corporation mats, stations tokens, and track tiles will be on the high-quality counter stock like what you´ll find in our more recent versions of the Deluxe Edition of Twilight Struggle.